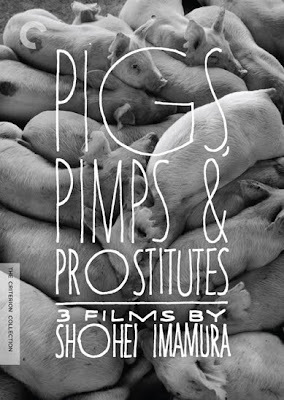 So... Pigs, Pimps and Prostitutes! This is a recent favorite of mine--three great films, and I was very happy with how the design came together. A different animal than my previous Imammura cover, Vengeance is Mine, but both are personal favorites, actually. The other element worth commenting on in those covers (apart from the film images, which hopefully speak for themselves), is the silhouetted "critters." 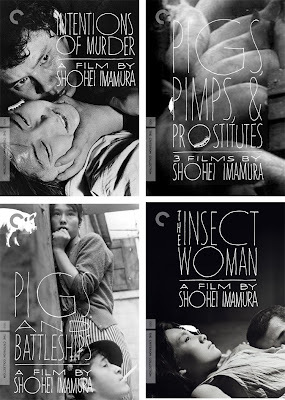 Each of these films features a prominent insect or animal as a central metaphor, (the pigs in Pigs and Battleships, the bug from the opening credits of Insect Woman, the silkworms and/or that centipede-looking thing that crawls up her thigh in Intentions of Murder), so it seemed like a good way to link them all together. And finally, just in case everyone hated the hand-drawn type, I tried this idea, which I have literally no justification for.. it seemed like a good idea at the time, but thankfully everyone DID like the hand-drawn type. 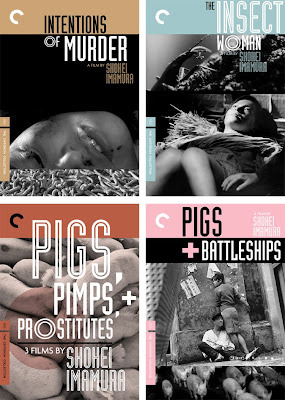 I remember seeing the final cover on Criterion a while ago. It's one of my favorite. I love the font together with the Corbis image - absolutely perfect. Thanks for sharing your creative process! It's so fascinating to get a behind-the-scenes look at the making of a Criterion cover! Thanks, Capree! I aim to please. Speaking of which, Anonymous, if you'll look again I think you'll notice I DID reference Dr. Strangelove AND Stop Making Sense (another Ferro design), though you're right that I should have called out the great Pablo Ferro by name. Consider it done now. Cheerfully (and embarrassingly) withdrawn. Great work! You mention that you made a font set of the hand drawn lettering, any chance you could make that available for download? My envy for hand drawn fonts seethes! Thanks for the kind words. No plans to make those hand-drawn fonts available at the moment, mainly because (a) I consider them a part of that specific design, not something that I'd feel comfortable seeing anywhere else, and (b) the fonts themselves are pretty sloppily built, and require lots of manual kerning, mix-and-match weights, etc, to make them workable. I'd be pretty embarrassed to let anyone try to work with them. Sorry to disappoint! Completely respectable. Thanks for the response! "A Murder of Crows: A Children's Primer"
Sorry!! Also: Stumblebum Brass Band!